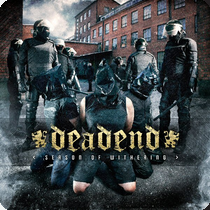 A highly melodic and intelligent progressive metal band from Finland (duh) Dead End Finland are a veritable heavy metal force. Their new record Season of Withering is a promising debut that showcases all of the power that this sort of metal can have. Highly polished and very refined Dead End Finland clearly know what they want to do and they are not afraid to embrace it fully and completely. With beautiful keyboard parts that accentuate manic guitar riffs Dead End Finland will capture the heart of any metal fan who likes a bit of everything in his music. What really makes this record special for me is the mix of cleans and growls, it is done with a lot of taste and the vocalist can actually sing and growl very well! It adds a whole new layer of power to the music and makes things even more powerful and passionate. Meanwhile the soaring soundscapes are beautiful, I think they are especially helped by the contrast of the melodic keyboard lines with the heavy guitar parts. This is especially clear on songs like Shape of the Mind where the guitars and keyboards work together nicely to create something that reaches out and touches the soul. What I'm really trying to say is that Dead End Finland get to the very heart of what they want to do on Season of Withering. So what's next after this glorious triumph? What can a band as talented as Dead End Finland clearly is do after releasing a record that seemingly fulfills all they want to do? I mean, think about it, the lyrics are intelligent and their anti society message is very well thought out. Meanwhile they have come up with a pretty unique mix of cleans and growls that comes off very well. Add in the very cool sonic templates that they create and you have a band that could very well be the next big thing! I for one can not wait for the sequel to Season of Withering!